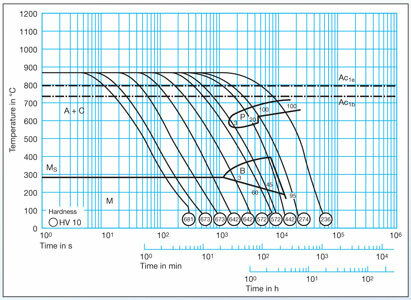 High speed steel [note 1] (HSS or HS) is a subset of tool steels, usually used in tool bits and cutting tools. It is often used in power saw blades and drill bits. It is superior to the older high carbon steel tools used extensively through the 1940s in that it can withstand higher temperatures without losing its temper (hardness). This property allows HSS to cut faster than high carbon steel, hence the name high speed steel. 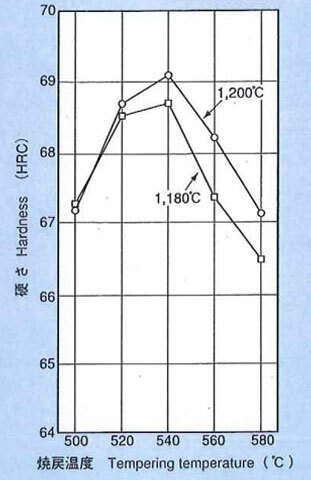 At room temperature, in their generally recommended heat treatment, HSS grades generally display high hardness (above HRC60) and a high abrasion resistance (generally linked to tungsten content often used in HSS) compared to common carbon and tool steels. The main use of high speed steels continues to be in the manufacture of various cutting tools: drills, taps, milling cutters, tool bits, gear cutters, saw blades, etc., although usage for punches and dies is increasing. 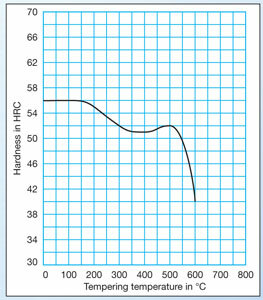 High speed steels also found a market in fine hand tools where their relatively good toughness at high hardness, coupled with high abrasion resistance and fine, made them suitable for low speed applications requiring a durable keen (sharp) edge, such as files, chisels, hand plane blades, and high quality kitchen and pocket knives. M2 is a high speed steel in tungsten-molybdenum series. The carbides in it are small and evenly distributed. It has high wear resistance. 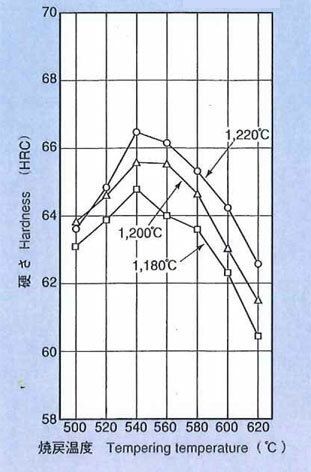 After heat treatment, its hardness is the same as T1, but its bending strength can reach 4700 MPa, and its toughness and thermo plasticity are higher than T1 by 50%. It is usually used to manufacture a variety of tools, such as drill bits, taps and reamers. Its decarbonization sensitivity is a little bit high. M35 is similar to M2, but with 5% cobalt added. The addition of cobalt increases heat resistance. M42 is a molybdenum-chromium-vanadium-tungsten high speed steel alloy with an additional 8% cobalt. It is widely used in metal manufacturing because of its superior red-hardness as compared to more conventional high speed steels, allowing for shorter cycle times in production environments due to higher cutting speeds or from the increase in time between tool changes. M42 is also less prone to chipping when used for interrupted cuts and cost less when compared to the same tool made of carbide. Tools made from cobalt-bearing high speed steels can often be identified by the letters HSS-Co.
To increase the life of high speed steel, tools are sometimes coated. One such coating is TiN (titanium nitride). Most coatings generally increase a tool's hardness and/or lubricity. A coating allows the cutting edge of a tool to cleanly pass through the material without having the material gall (stick) to it. The coating also helps to decrease the temperature associated with the cutting process and increase the life of the tool. 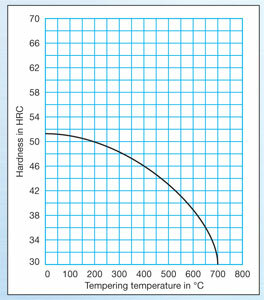 To achieve wear resistance higher hardness is recommended. 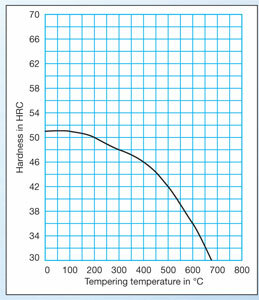 For better impact strength steels with better toughness are suggested. 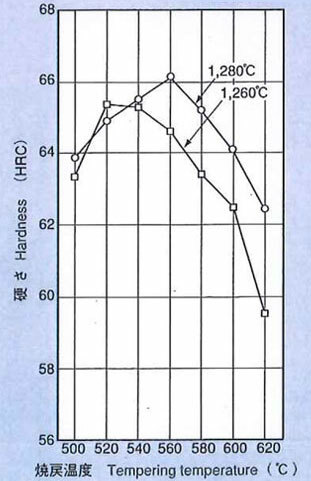 Toughness normally depends on the Hardness level and the Microstructure of the steel like Carbide distribution, grain size,inclusion ratings etc. For Forging, forming, shearing, pressure die casting and punching at elevated temperatures hot work tool steels are used which maintain their Wear resistance, mechanical properties etc. at these elevated temperatures. 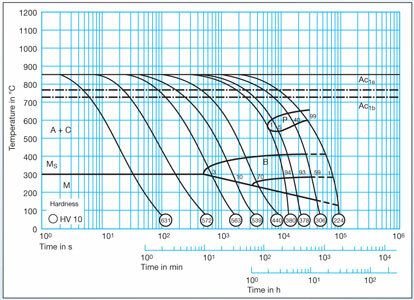 The main problems encountered in a PDS die are Heat checks, Erosion and Crack. 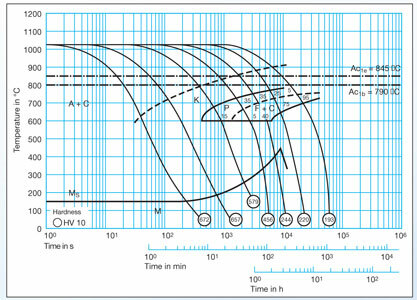 Right selection of tool steels can help minimize these problems and optimize die life. Another important use of Hot Work tool steels is in the area of forgings, done at elevated temperatures by use of vertical presses and Hammers. Press forging the pressure is applied fast unlike Hammer forging where the drop of hammer die is sudden and very fast.In case of latter High toughness material is required to absorb this impact load while in Press forgings high strength hot work tool steels are recommended. Normally forging hammer die material is supplied in prehardened condition of 360-410BHN. Extrusion is another important application of Hot work tool steels. This is a process to convert an Ingot or billet in pre heated condition to desired cross section or profile by forcing the metal though a die. 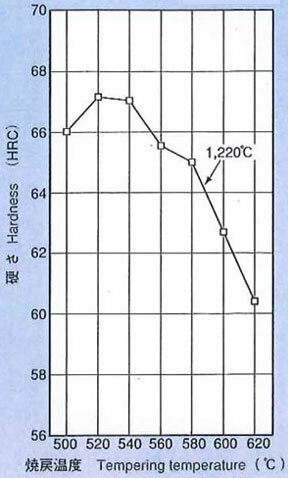 Apart from the normal properties as in PDC die material,nitriding ability is also desired to avoid abrasive wear.Due to tough working conditions like high temperatures and pressure, the die life is reduced if proper care is not taken in choosing the die material.Normally AISI H11 and H13 are most popular extrusion die materials. 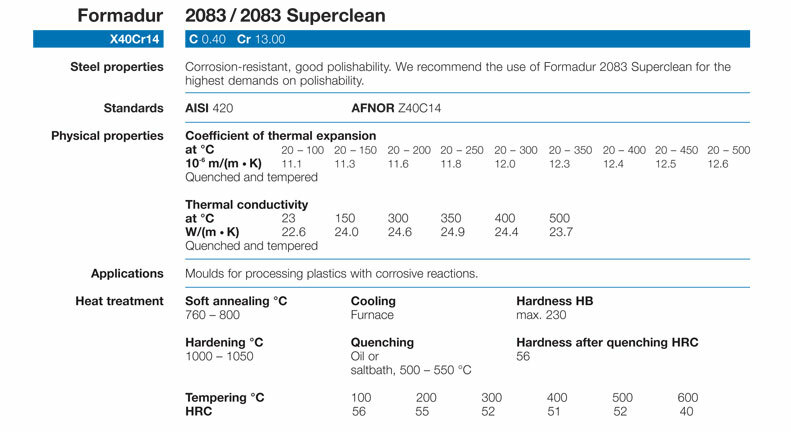 The amount of abrasives added to the plastics (to improve the properties like hardness etc. on the component) increases the wear on the mouldsteel.In such cases higher pressure is needed to mould these components,as such great care must be taken in choosing the right kind of steel. 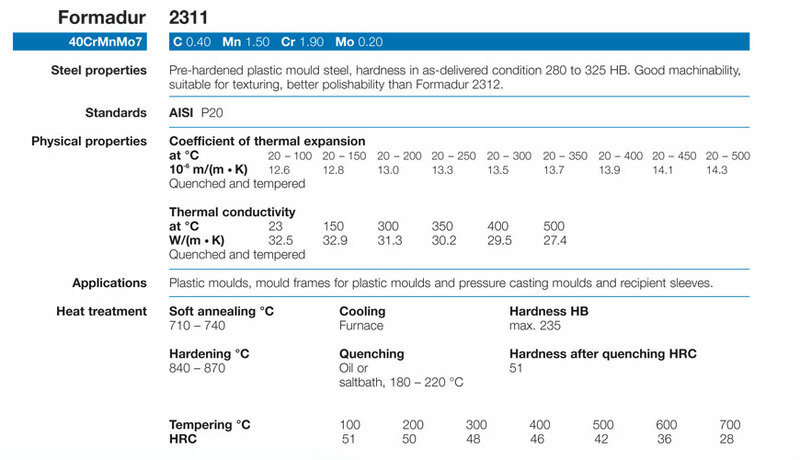 For lower abrasive plastics, DIN 1,2738 and DIN 1,2311 are good.While for Medium abrasive level DIN 1,2344 is good.For higher abrasive plastics steels like DIN 1,2083,HPM38,DIN1,2316,HPM77, DIN 1,2379,D2,SLD etc. are recommended.